"This will be a day long remembered. It has seen the death of Kenobi, and will soon see the end of the Rebellion." When looking to crush the Rebellion, the Galactic Empire will muster all the force they can to make an example of the miscreants who dare to threaten the order and stability of the galaxy. It will take a legion of soldiers and destructive vehicles to make an example of those who stand againt the Empire. Luckily, reinforcements have arrived. The Stormtroopers Unit Expansion, the AT-ST Unit Expansion, and the 74-Z Speeder Bikes Unit Expansion for Star Wars™: Legion are available now from your local retailer or our website, alongside the Star Wars: Legion Core Set. Start your journeys into the infantry battles of the Star Wars universe today! Few in the galaxy are as precise as the Imperial Stormtrooper, and you can supplement your army with these loyal soldiers via the Stormtroopers Unit Expansion. 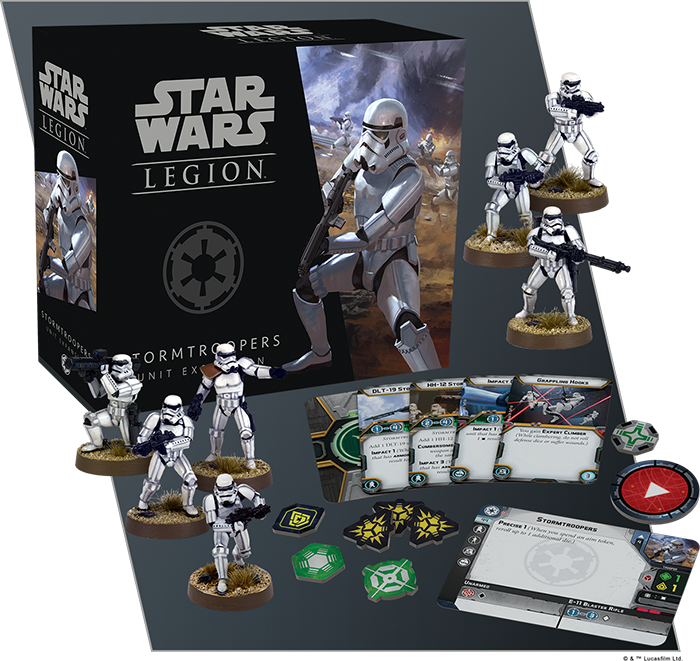 This expansion features seven unpainted, easily assembled Stormtrooper miniatures, along with the cards and tokens that you need to add this new squad of Stormtroopers to your army. 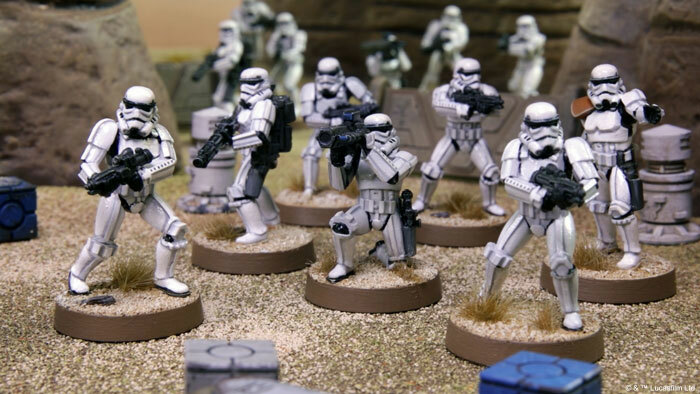 At only 44 points for a unit of Stormtroopers, they are perfect for filling out the rank and file of your army. As nameless infantry, Stormtroopers are rarely the offensive powerhouse of an army. With their mass-produced E-11 blaster rifles, each Stormtrooper only contributes a single white die to an attack. However, what the Stormtroopers lack in firepower they make up for in their powerful white armor, rolling one red defense die when they are targeted. For a full preview of the Stormtrooper Unit Expansion, including its array of upgrade cards, click here! Raw power alone isn’t enough to overwhelm the Rebel forces; speed will play an important role as well. This is where the 74-Z Speeder Bikes Unit Expansion comes into play. 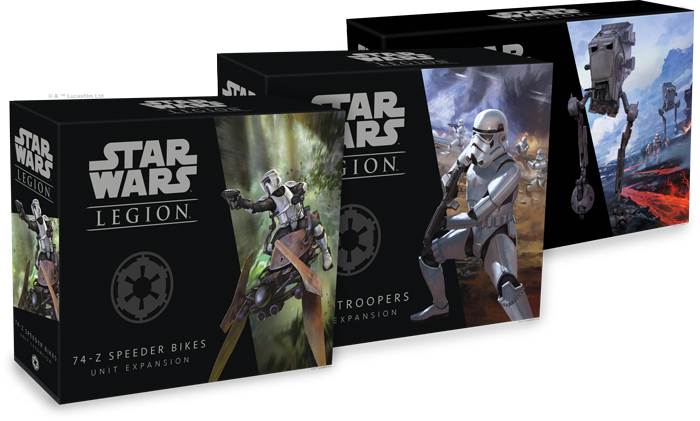 Within this unit expansion, you’ll find two unpainted, easily assembled 74-Z Speeder Bike miniatures, ready to add another unit to your army. 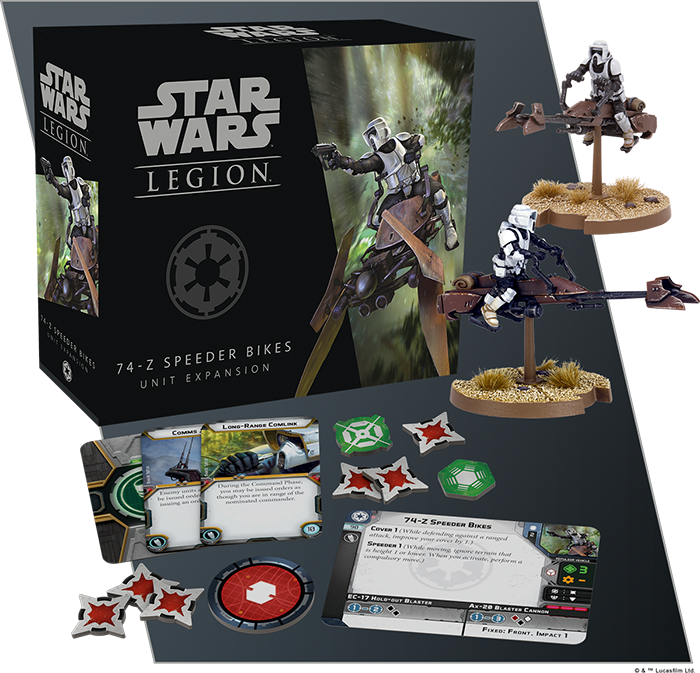 One of the miniature sculpts is identical to the 74-Z Speeder Bike miniature included in the Core Set, while the other offers a variant design to add variety to your army. Using the largest movement tool in the game as well as receiving a compulsory move forward at the start of their activation means that the 74-Z Speeder Bikes are nearly unrivaled in terms of their speed and mobility. Use these powerful tools to strafe your enemies and defeat them before they even know what hit them! For a full preview of the 74-Z Speeder Unit Expansion, including its upgrade cards, click here! Nothing can intimidate the Rebels like the pure size and scope of massive AT-ST walkers. 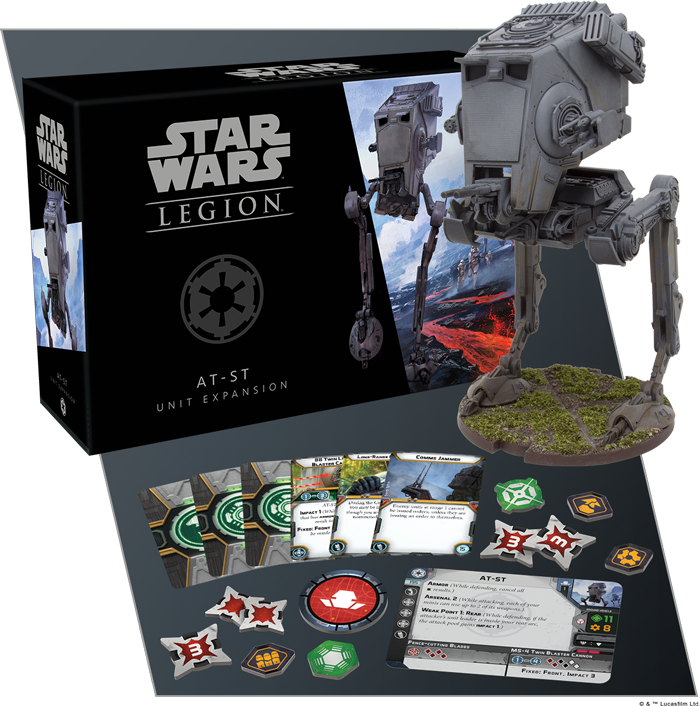 A standard Star Wars: Legion army limits your forces to two heavy units, and hulking vehicles like the AT-ST will become the centerpiece of your forces. Coming in at a base cost of 195 points, a single AT-ST takes up almost a quarter of your full allotment of 800 points in a standard game. But what it gives you in return is immeasurable power and durability. Between the highest health in the game and its heavily armored shell, even the most persistent Rebels will be hard-pressed to deal lasting damage to the behemoth without heavy artillery. 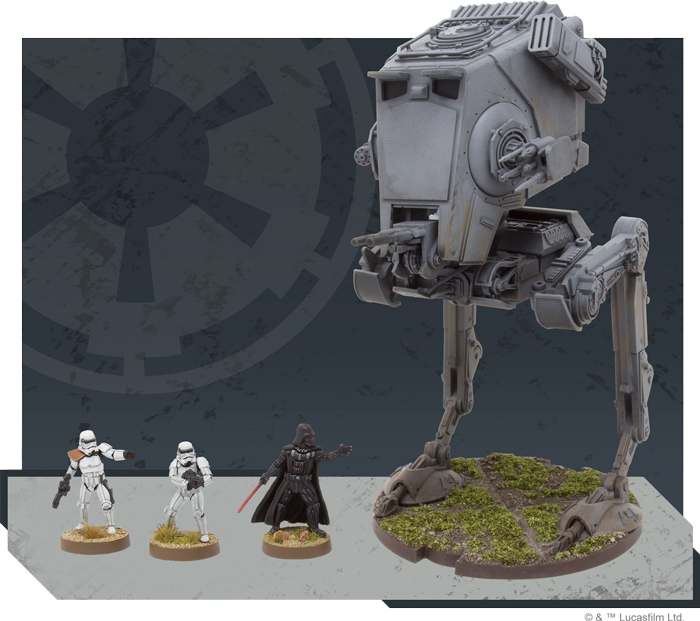 The AT-ST Unit Expansion features a massive AT-ST miniature as well as all of the upgrade and unit cards needed to add the behometh to your army. All AT-STs come inherently equipped with an MS-4 Twin Blaster Cannon: a powerful cannon that can be used against armored vehicles with good effect. But that's not the end of the weapons you can load into your AT-ST. For a full preview of the AT-ST, including its upgrade cards, click here. The power of the Galactic Empire will crush the Rebellion. It's just a matter of bringing your full force to bear. Bolster your armies and maintain order in the galaxy with these three unit expansions for Star Wars: Legion! Bring in reinforcements to supplement your Core Set (SWL01) with the Stormtrooper Unit Expansion (SWL07), the 74-Z Speeder Bikes Unit Expansion (SWL06) and the AT-ST Unit Expansion (SWL08) for Star Wars: Legion, available now from your local retailer or our website!